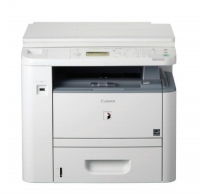 Description for 1133 Canon imageRUNNER 1133 Office Black & White Printers. This compact multifunctional device features double-sided document output as standard. Time and cost saving capabilities ensure you hit deadlines and save money too. Features: - Print, copy and scan; - Print speed of up to 33 ppm; - 5-line user interface; - Print from and scan to USB; - Network ready, optional PCL and PS; - Energy efficient; - Embedded uniFLOW and e-Maintenance capability. Productivity With a first copy out time of 8 seconds and an output of 33ppm, the imageRUNNER1133 is a compact performer. Designed to improve the productivity of small businesses and workgroups, it has a small footprint, up to 1,050 sheet capacity and a platen scanner. A 5-line display panel is especially easy to use, saving time. Documents can be scanned in colour via the platen scanner. Compatibility with Canon’s uniFLOW solution allows My Print Anywhere, enabling prints to be collected at the most convenient device on the network. In addition, the imageRUNNER1133 offers the convenience of scanning to - or printing from - a USB memory stick. Cost control Compatibility with Canon’s uniFLOW software provides greater transparency of costs, allowing you to track as well as charge specific print jobs to individuals, departments and projects. Compatibility with Canon’s e-Maintenance can further improve uptime through remote diagnostics, automated meter readings and consumables monitoring to reduce administrative time. And with click charging, you only pay for what you print giving you greater control of costs. Security A built-in security feature means prints are “held” until the relevant user identifies themselves, using a PIN number. This prevents documents piling up in output trays and being viewed by unauthorised eyes. Up to 5 can be stored at once. Alternatively with Canon’s uniFLOW solution, this can be combined with card security systems, enabling users to instantly access and print as many jobs as they wish. And once printed, they’re automatically deleted for watertight document control. Lower environmental impact The imageRUNNER 1133 qualifies for the ENERGY STAR® and has an exceptionally low TEC (Total Energy Consumption) rating and consumes as little as 3-watt power consumption in sleep mode. Highly productive double-sided printing saves more cost and time - as well as paper. Integration The imageRUNNER 1133 can be seamlessly integrated into your existing IT framework with optional PCL and PostScript support. uniFLOW compatibility means the device can easily sit alongside all imageRUNNER ADVANCE devices for efficient mixed fleet deployments Once connected, iW Management Console (iWMC) enables you to manage and monitor your whole fleet, from a single point of control.